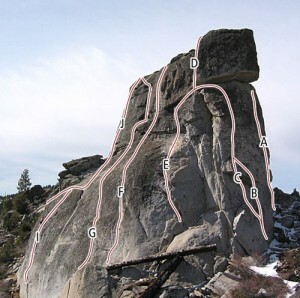 The best 5.7 face climb at Phantom Spires. A thin bolt-protected 5.7 move leads to a cool 5.7 roof followed by big holds on a steep moderate wall. Protect with knob tieoffs and gear in horizontal cracks. Either belay under the roof on 1-3” cams or traverse left or right to bolt anchors. From the right bolt anchors, don’t miss toproping Lean and Mean. Which SuperTopo guidebooks include a topo for Over Easy?